live person available, 24 hrs/day, 365 days/year. 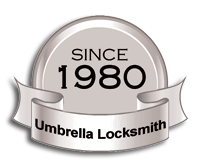 WELCOME TO UMBRELLA LOCKSMITH AND SECURITY SYSTEMS! We are a complete locksmith and alarm company offering 24 hour service in the NYC Manhattan area since 1980. Our knowledgable staff, commitment to excellent service and reliable performance is your assurance of quality work.